It's never easy getting back from the dead. It can really screw you up in the head. Well, that is what Jason once told me. One night whilst drinking grass tea. Which was made out of green chicken and stale bread. As Written by Scott Lobdell; Drawn by Pasqual Ferry, Ig Guara, and Brett Booth; plus Published by DC Comics in October 2012. Imagine if you will. Your father is a low-life scum-bag who keeps on getting into trouble because of his dubious ways. Your mother is ginger-haired dope-addict who keeps on overdosing on drugs. And you are their son, Jason Todd, in this tale called 'Everybody Has To Start Somewhere'. But don't fret though. After a run in with Doctor Leslie Thompkins, the vigilante known as Batman enters your life, and he feeds you, takes care of you, and trains you up to be his next side-kick, Robin. Just make sure that you will not go looking for your mother, OK? Or otherwise the Joker will kill you, and you will become reborn in the L'azarus Pit'. Ooop! What a silly boy you are. Meanwhile, in the Joker back-up feature, the Harlequin of hate states that he was the person who manufactured your origin since your inception. Oh! Tough talk. I did get a kick out of the way this issue started, plus the overall 'Jason commenting on his own life' manner that this tale was presented to us in. For example, on the first page Jay stated "This is my mother on the day I was born. In her defense she really needed a cigarette. This is my Dad a hallway away. He had a way with the ladies. This? The day I died. The first time. We'll come to this later". Ha! Poor Jason's fate was sealed as soon as he popped out of his mother 'private parts'. What a sod. ... when Jason got to the part about how he was introduced to 'Batman's world' -- no -- this didn't feel right to me at all. It was too fleeting in nature, as if it was quickly cobbled together to patch up a whole in the story-line. STORY: Although I am sitting on the fence with this particular strand of the tale, I did find it very intriguing how Joker masterminded Jason's origin from behind the scenes. Admittedly, it was put across in a very overt manner. Nonetheless, the concept of 'A villain creating a hero so he could hurt another' is a very original concept to explore in the future. Right? ART: Now I know this may sound rather 'nit-picky', but the one thing I found wrong with the art in this issue -- wasn't the art itself -- it was the manner in which this three-stand-ed story was sign-posted. Pasqual Ferry, Ig Guara, and Brett Booth, are all very different illustrators, who worked on different sections of this story. So if each section was highlighted in a cleverer fashion, the 'jolts' from one section to the next -- mainly the Ig to Brett transition -- would have been less jarring. 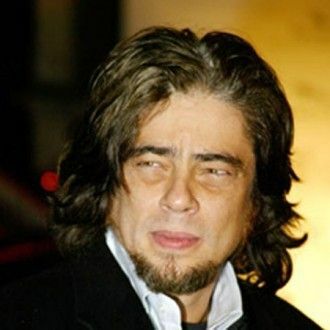 JAY'S DAD: ... Benicio Del Toro. Well, can't you just see this great actor teaching his son how to steal from a convenience store? Mine did. Ops! Errrr... next question please. Sometimes A Persons Life Is Doomed To Fail As Soon As It Can Begin. 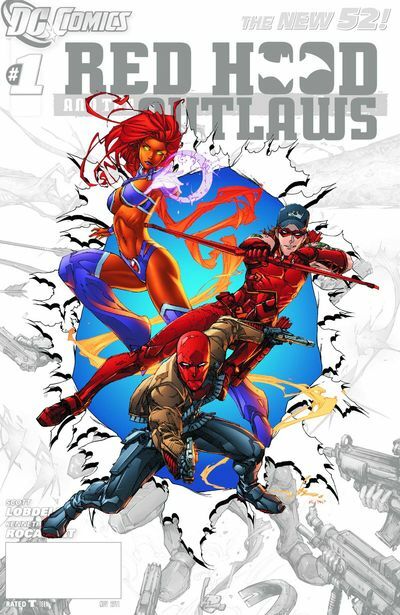 I thought that this issue of 'Red Hood and the Outlaws' was a fairly decent read in hindsight. The story was a jovial one. The 'innovations' were incremental. Plus the overall sheen to this adventure was light and pithy in execution. Granted, I know that the 'Joker inclusion' might stir up some controversy on facebook, and Jason's 'new introduction' to 'Batman world' does negate his two previous introductions by default. Still, no major damage done at the moment, right? Mealy a side-step at best.